MEL is a 50:50 joint venture project between SSE and Wheelabrator Technologies Inc. MEL’s FM2 project will process up to 675,000 tonnes of waste derived fuels from various sources of municipal solid waste, commercial and industrial waste each year to produce around 70 MW of electricity, enough to power around 160,000 homes. * The project will be located on land next to the newly constructed Ferrybridge Multifuel 1 (FM1) project, which entered commercial operations earlier this year. A boost to the local economy through supply opportunities worth at least £10 million over the three year construction phase. Engagement with local stakeholders, community groups and businesses will continue as the plans for construction progress. Further announcements on which company has been selected for the EPC contract will be made in due course. * Based on the industry average annual household consumption of 3,300 KWh of electricity and using a base load of circa 70MW net export capacity utilized for 8000 hours per annum. MEL is a 50:50 joint venture between SSE plc and Wheelabrator Technologies Inc. In July 2015, MEL completed the construction of FM1 after the facility successfully went through its commissioning phase. Today MEL has a pipeline of development projects which will provide the UK with merchant capacity, reducing the need to landfill residual waste or see this valuable resource exported overseas. generation capacity of around 3,400MW. Through its renewable development division, SSE Renewables, it is involved in the development of new renewable energy projects covering wind, wave, tidal, and hydro electricity. Wheelabrator is a world leading energy from waste (EfW) company operating in North America, Europe and the UK. Wheelabrator is a wholly-owned subsidiary of Energy Capital Partners, an energy-focused private equity firm with over $13 billion in capital commitments. 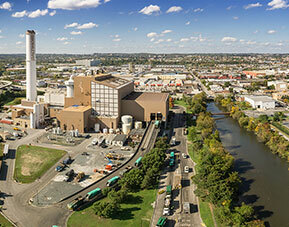 Wheelabrator has developed, owned and operated EfW facilities for 40 years. Today, it currently owns and/or operates 20 energy facilities in the United States and United Kingdom, 16 of which are EfW.